Every once in a blue moon I watch a horror or fantasy movie and something just clicks with me artistically. I don’t want to just add the idea to my art bucket list but I want to pick up the pencil and bring my vision to life right away. This was one of those exceptions. When it was announced that Damien Leone’s Terrifier was added to Netflix in September I didn’t waste a minute to add it to my queue. I had seen pictures and heard about the movie but had yet to actually watch it. So needless to say I was excited I was finally going to be able to. My face should’ve been hurting from all the smiling I did as I watched David Howard Thornton bring life to this mute creepy clown on my screen. Disclaimer: I blame my weird obsession with the circus and my love for 80s slasher films. Normal people probably won’t have the same reaction to this film ha ha. After my husband and I watched the movie I could not stop thinking about how badly I loved David’s performance as Art The Clown and wanted to draw him. I had an idea in mind already but I had other art projects and commission pieces to wrap up. But as soon as I had free time I started on the Art piece (pun intended). Pretty ironic too that I finished it in October. I call it #SELFIE and it was inspired by Art’s 2 fun looks in the movie…. As I was drawing the left side, I kept joking around with the tagline from Maybelline. I kept saying things to myself like “Maybe he’s born with it? Maybe he’s just really good at scalping and skinning crazy homeless woman and then wearing them” ha ha. Yah…I had a lot of fun with this one. If you’re also a fan of David Howard Thronton as Art The Clown in Damien Leone’s Terrifier then you can pick up prints and shirts in my Etsy and Amazon shops. You can see Art and the rest of my portrait work on the Spitting Image page of my portfolio website. How would you like to own your very own piece of the undead? How would like to display it on your wall like a hunting trophy?? Look no further!!! Smiley is officially up for adoption! But be warned he is always looking to have some FUN! 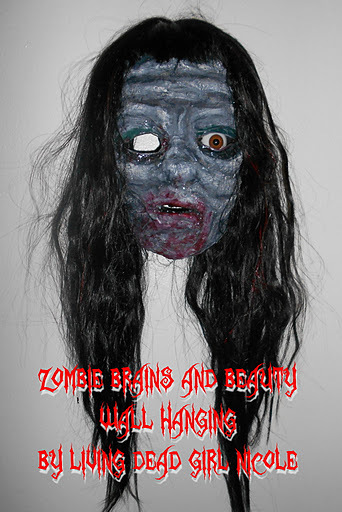 Smiley is the 4th piece from my Limited Edition, Zombie Faux Taxidermy Line (wall hangings) that I have made. The 1st one was a blonde pinup girl zombie, the 2nd was a long-haired ghoulish zombie and the 3rd was a mental patient zombie! Might I add that Mercy the Mental Patient Zombie is also still up for adoption here! Smiley or Mercy can be hung on your wall or they work well displayed on a plate stand (not included but can easily be found for cheap online)! Purchase them in my Etsy or Amazon shops and stop by the Adopt The Undead page of my portfolio to see the other undead creations I have made.